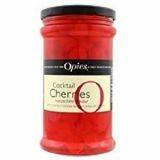 Small 225g jar of Opies red maraschino liquor flavoured cherries without stems. 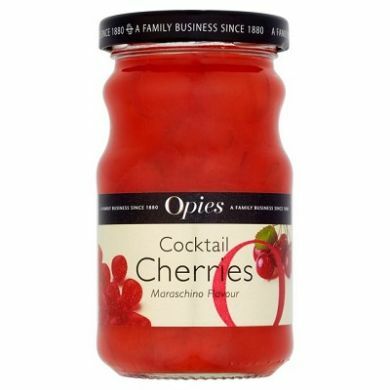 Opies cocktail cherries are used by bartenders, mixologists and chefs around the world to add the final flourish to cocktails and desserts. Flavoured with alcohol-free maraschino flavouring. Maraschino is an Italian liquor created by distilling Marasca cherries. 225g of cherries in flavoured syrup. 125g of cherries by drained weight.